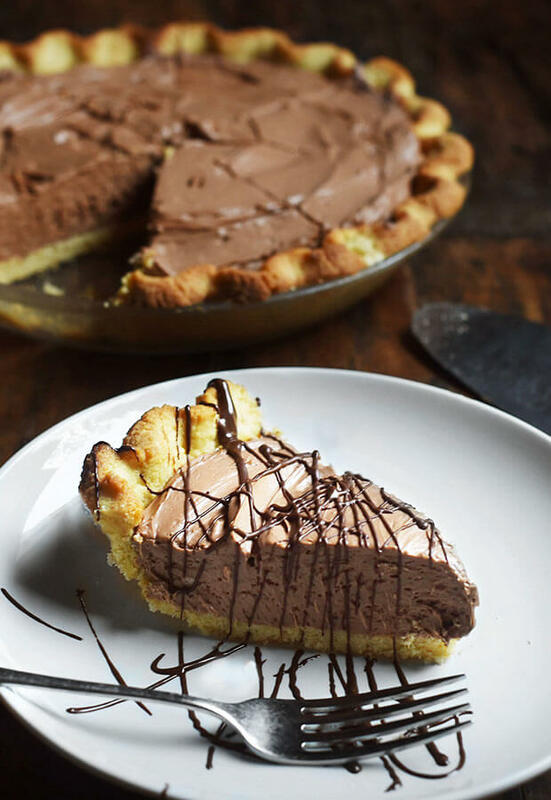 This chocolate silk pie seems so extravagant, it’s hard to believe it’s low-carb and keto friendly. A golden flaky crust is filled with creamy rich chocolate filling that melts in your mouth. The combination satisfies any craving for a decadent chocolaty dessert. 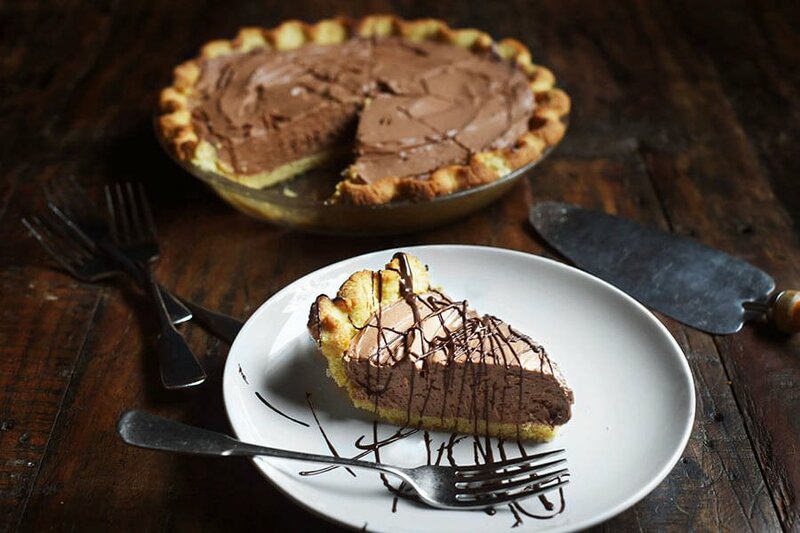 Keto Chocolate Silk Pie is easy enough to prepare for a family meal, but it also makes a perfect dessert for celebrations and holidays. It’s the kind of dessert everyone loves and a recipe your guests will be asking for. 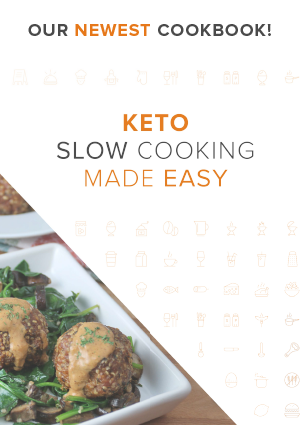 What makes it even better for entertaining is that it can prepared ahead of time. Make it the day before and you don’t have to think about dessert on the day of a party. Just be sure to give it at least three hours to refrigerate before serving. 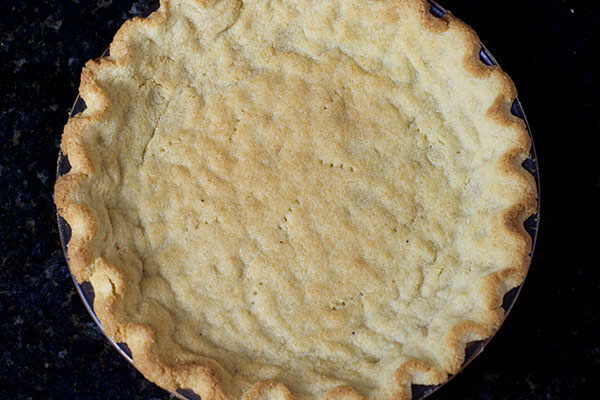 The crust of this pie is a simple almond flour crust. This flaky, slightly sweet, pastry dough provides a lovely contrast from the sweeter silky chocolate filling. The crust is baked prior to filling since the filling does not required baking. 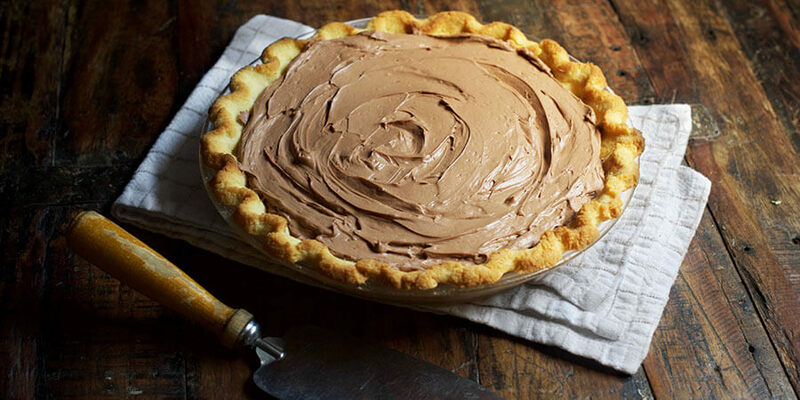 The luscious filling has a cream cheese base with rich cocoa. There’s an additional hint of butter for added richness. Whipped cream is folded in to lighten it and provide a silky, velvety, texture. 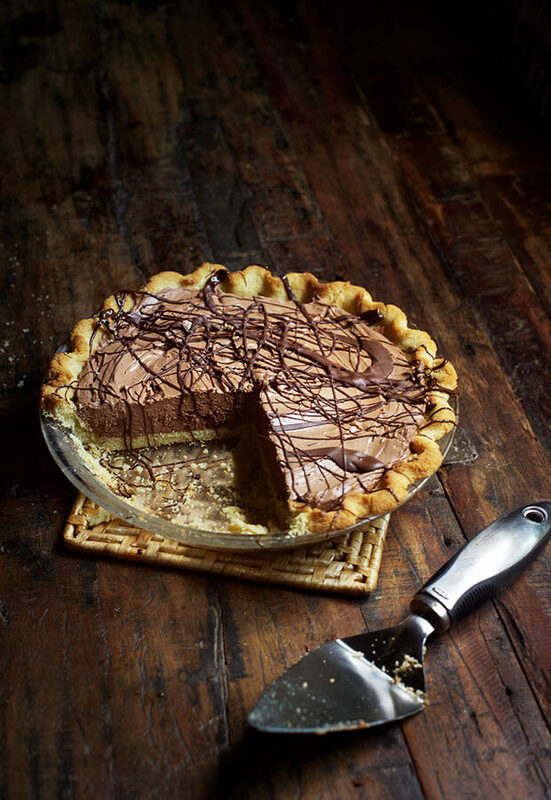 This chocolate silk pie will satisfy any dessert craving you might have. 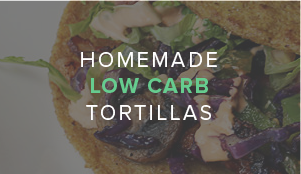 With this recipe, you can curb that chocolate dessert craving without the guilt! Yields 10 servings of Chocolate Silk Pie. 2. 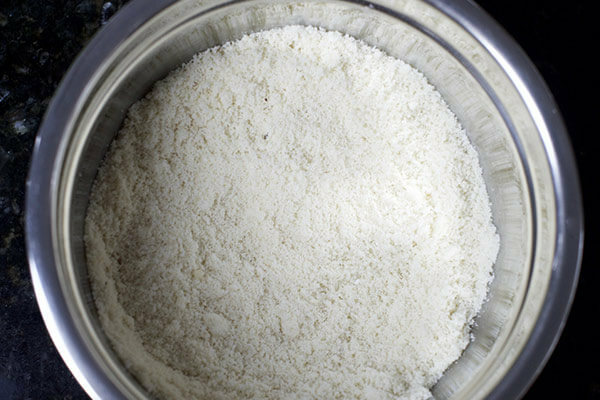 In a medium mixing bowl, combine almond flour, baking powder, salt and 1/3 cup stevia/erythritol blend. Using a whisk, blend the dry ingredients together. 3. Add butter to dry ingredients. 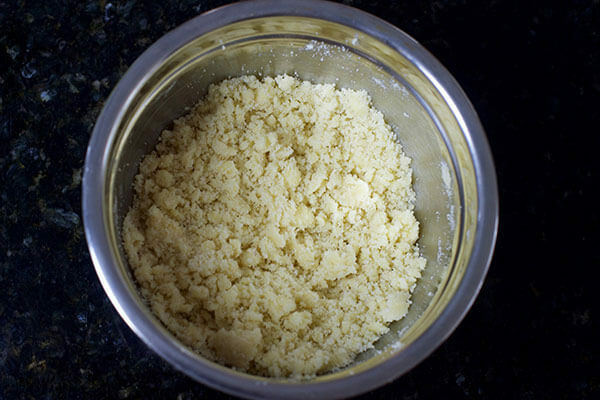 Using a pastry blender, whisk or a fork, cut the butter into dry ingredients until the mixture forms into coarse crumbs. 4. Add egg and vanilla extract and stir until the dough forms into a ball. 5. Transfer the dough to the prepared pan and spread out the dough using your fingers until it evenly covers the bottom and sides of the pan. Wetting your hands with cold water can help prevent the dough from sticking to your fingers. Flute edges if desired. 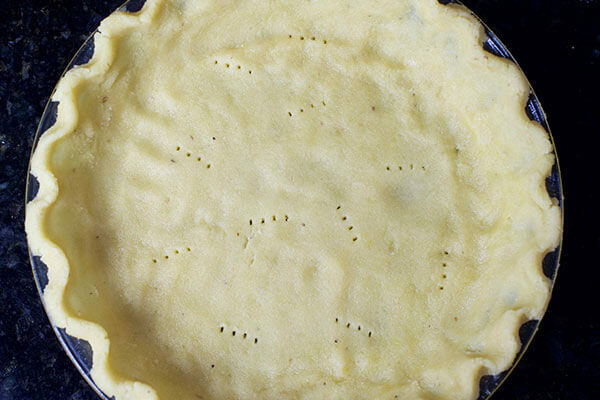 Using a fork, poke holes in the bottom and sides of crust to prevent bubbles from forming as it bakes. 6. Place crust in the oven and bake for 11 minutes. Remove crust from the oven and loosely cover edges with foil. Return it to oven for 5 to 8 more minutes or until the bottom of the crust is golden brown. Allow the crust to cool completely before filling. 7. 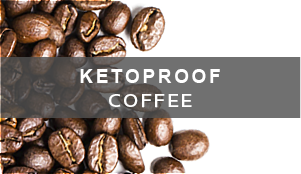 To prepare the filling, place cream cheese, sour cream, butter, vanilla extract, ½ cup stevia/erythritol blend and cocoa powder in a medium bowl. 8. Using a mixer on low speed, blend ingredients to combine, then increase to high speed and beat until fluffy. 9. Place the whipping cream in a separate small bowl. 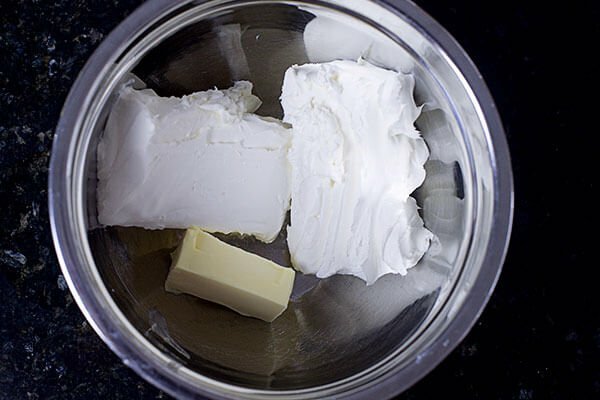 Using clean mixer beaters, whip the cream on high speed until soft peaks for. Add the 2 tsp. sweetener and 1 tsp. vanilla extract and beat until stiff peaks form. 10. 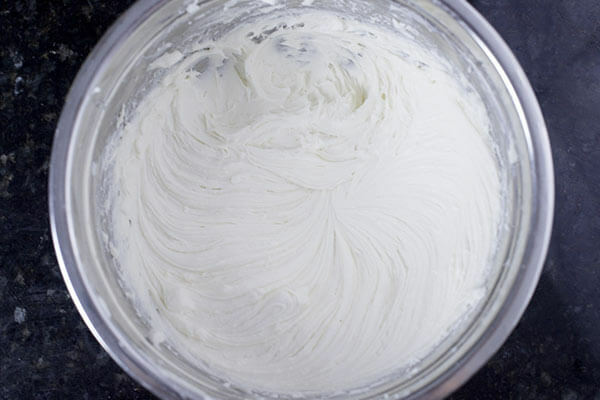 Gently fold 1/3 of the whipped cream mixture into the cream cheese mixture to lighten. Add remaining whipped cream mixture and fold it in gently. The idea is to blend the two mixtures together without breaking the bubbles in the cream. 11. Scoop the filling into the crust and smooth the top with a spoon. 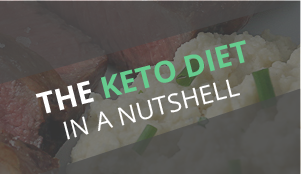 Cover and refrigerate your keto chocolate silk pie for at least 3 hours before serving. 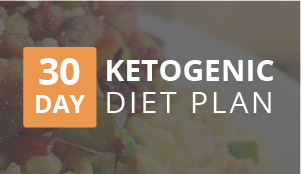 In a medium mixing bowl, combine almond flour, baking powder, salt and 1/3 cup stevia/erythritol blend. Using a whisk, blend the dry ingredients together. Add butter to dry ingredients. 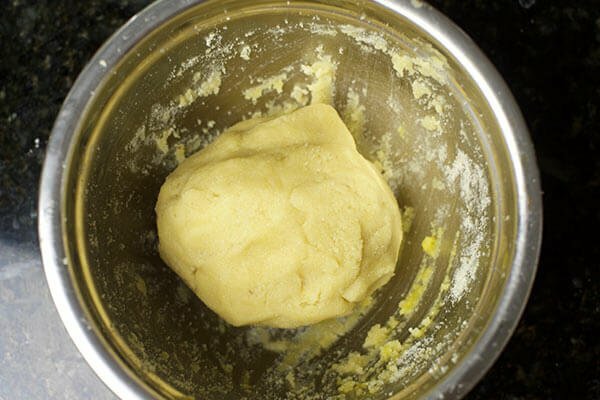 Using a pastry blender, whisk or a fork, cut the butter into dry ingredients until the mixture forms into coarse crumbs. Add egg and vanilla extract and stir until the dough forms into a ball. Transfer the dough to the prepared pan and spread out the dough using your fingers until it evenly covers the bottom and sides of the pan. Wetting your hands with cold water can help prevent the dough from sticking to your fingers. Flute edges if desired. 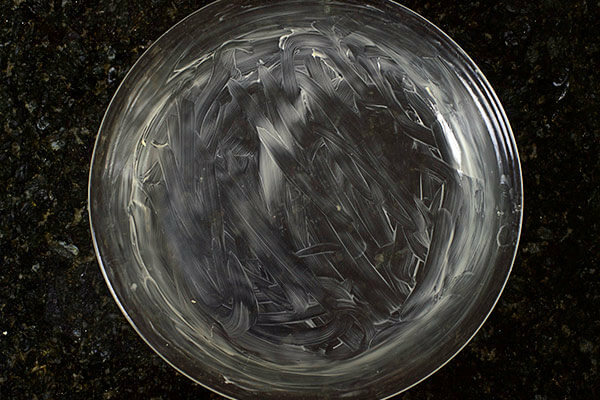 Using a fork, poke holes in the bottom and sides of crust to prevent bubbles from forming as it bakes. Place crust in the oven and bake for 11 minutes. Remove crust from the oven and loosely cover edges with foil. Return it to oven for 5 to 8 more minutes or until the bottom of the crust is golden brown. Allow the crust to cool completely before filling. 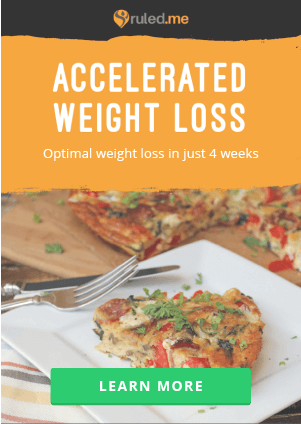 To prepare the filling, place cream cheese, sour cream, butter, vanilla extract, ½ cup stevia/erythritol blend and cocoa powder in a medium bowl. Using a mixer on low speed, blend ingredients to combine, then increase to high speed and beat until fluffy. Place the whipping cream in a separate small bowl. 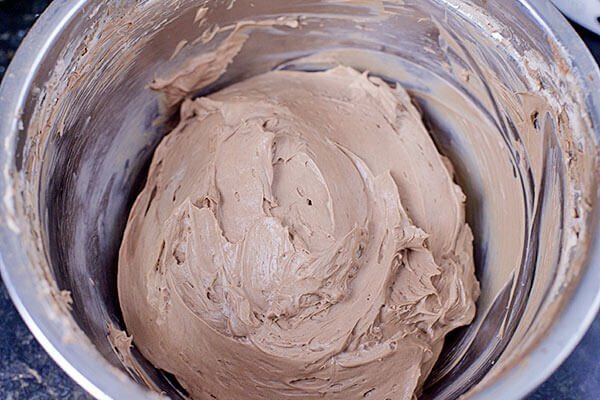 Using clean mixer beaters, whip the cream on high speed until soft peaks for. Add the 2 tsp. sweetener and 1 tsp. vanilla extract and beat until stiff peaks form. 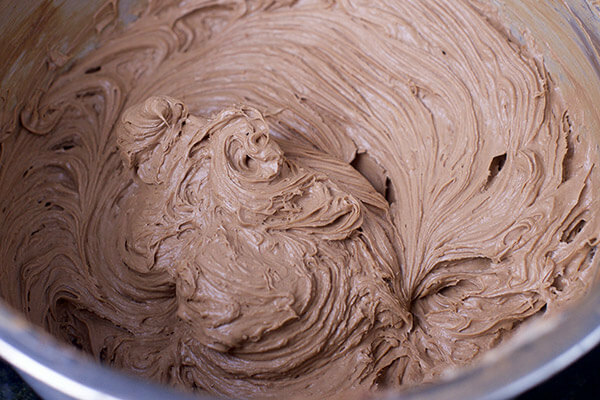 Gently fold 1/3 of the whipped cream mixture into the cream cheese mixture to lighten. Add remaining whipped cream mixture and fold it in gently. The idea is to blend the two mixtures together without breaking the bubbles in the cream. Scoop the filling into the crust and smooth the top with a spoon. 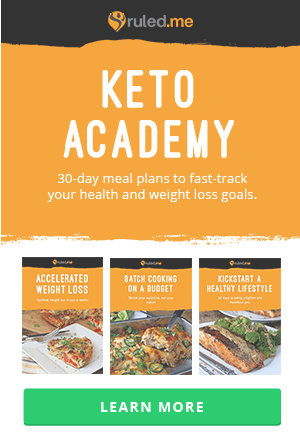 Cover and refrigerate your keto chocolate silk pie for at least 3 hours before serving.